Home Mac Software Windows How to Split and Merge PDF on Windows 10 Operating Systems? How to Split and Merge PDF on Windows 10 Operating Systems? Many times users face various management issues while working with the large set of PDF documents. It becomes very difficult to handle all files together. Therefore, there arises a need to combine multiple PDF documents. On the other hand, when the user tries to open large size PDF document then, suddenly system starts hanging. Not only this, most of the times uploading and downloading large PDF documents take a lot of time. Hence, users search for the solution to split large pdf files. So, to resolve all such problems here we have provided the simple solution which helps the user to Split and Merge PDF documents. There can be various root cause due to which users want to split and merge PDF files. Let’s suppose someone is sending large PDF document. But, due to large size person found the error messages and could not send the document. Hence, in such cases, it is needed to divide PDF into multiple files so that small sized files can be easily sent. At times, if the user is having multiple PDF documents then, there might be a chance of file misplacing. So in such situations, we need to combine multiple PDF documents. Click OK button to extract pages from PDF file. As discussed, there are many limitations of using the above manual approach. Therefore, you can go for the automated software i.e. 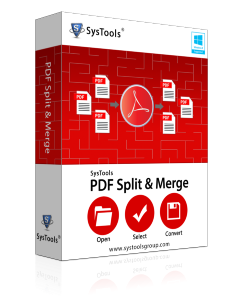 SysTools PDF Split & Merge. This tool easily combine and split PDF documents without any data loss. There are several options provided by the tool to split PDF documents like Split by page, Split by range, Split odd pages, Split even pages. As per user requirement, they can choose any of the options. Moreover, the interface of the software is quite easy and self-descriptive. Such that even non-technical users can use it efficiently to split and merge PDF files. It is the completely platform-independent tool that can easily run on any versions of Windows Operating Systems. In the following blog, we have tried to explain different solutions to split and merge PDF documents. There is a manual approach that can let the user perform the task but, it has several drawbacks. For that purpose, we have mentioned the professional solution to combine and split PDF files. The tool has an easy user interface can be used by technical as well as non-technical users without any hassle.